There are many tour guides who can tell you about the eternal city better than us. But cycling in the city is not the greatest even if it is Rome, and that is why it is better to head for its surroundings, its hills and the Apennine Mountains. 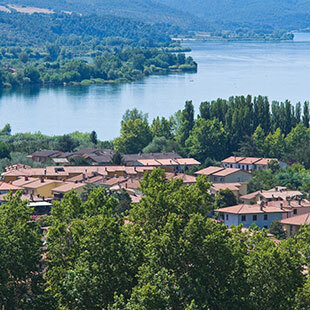 A few km away from Rome, in the quiet scenery of its castles, you will have the opportunity to enjoy a peaceful natural landscape of lakes and pleasant hills that surround the plain in which the city lies. This destination is very popular for the beauty of its routes: quiet roads, medieval villages and scenery that will leave speechless even the most sceptical visitors. Fiuggi and Viterbo are the places to mark in your diary for a cycling holiday. If we were to briefly describe this destination, we would say: from 800 m to 2100 m in a few rides. 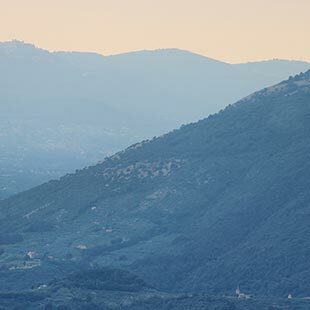 Fiuggi is in fact completely surrounded by nature in the Ernici Mountains, just a few kilometres away from Rome and offers routes where you can quickly gain elevation without the need of riding for kilometres of plains before reaching the first ascent or single track trails. 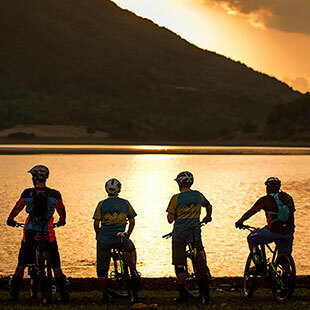 Campocatino is the favourite destination of enduro enthusiasts while Guarcino is a beautiful natural Bike Park. 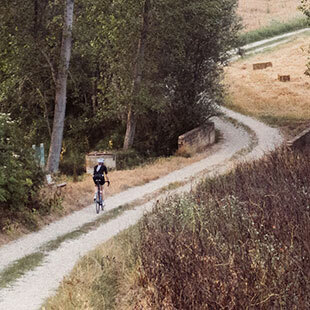 The most popular single track trails among local cyclists are Frascara and Gabriella. 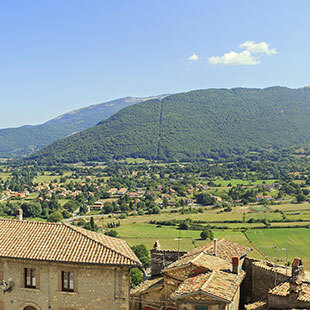 Instead, if all you want is just a relaxing cycling holiday in Fiuggi, you will also find it. The Cesanese wine route, a ride around Lake Canterno or the spectacular road from Fiuggi to the eternal city (Rome) are what you’re looking for. They are particularly pleasant with an e-bike. 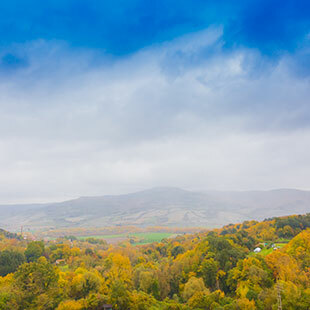 The area surrounding Viterbo is mainly hilly with gentle ascents that never go over 10 km. 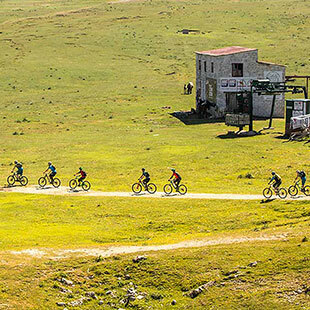 Here, mtb enthusiasts will have the opportunity to ride through tufaceous roads, old forests, hot springs and volcanic lakes. 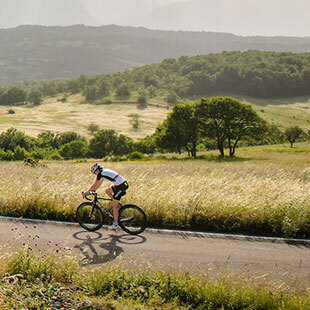 The most popular areas among bikers are the lake areas (Bolsena, Vico and Bracciano) with fairly easy routes and Mount Fogliano which includes 3 routes completely marked with wooden signs. It is mostly a hilly area with plenty of trails and single tracks trails. The origins of this dish aren’t very clear; it’s said that it was probably invented by Americans during the Second World War. The story goes that, given the poor food rations, the military of the time decided to combine the powdered eggs and bacon with pasta. Now we prepare it using pork cheek, pecorino cheese and pepper. Spaghetti cacio e pepe derive from the traditions of the capital’s working-class suburbs. Although there are only two ingredients, sheep’s milk cacio cheese and pepper, the skill of a Roman chef is determined by their ability to create a thick, creamy and tasty sauce. 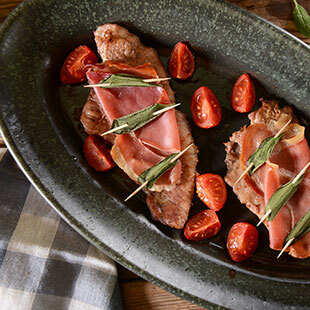 Very characteristic of Roman gastronomy, Saltimbocca alla Romana is an easy and quick dish to make. It’s prepared by fixing a sage leaf and a slice of ham to thin fillets of veal rump with a toothpick, and braising the meat in a pan. Lazio is a very varied region in terms of its territory and traditions, with a wealth of evidence of the past, starting with Roma Caput Mundi, an open-air museum where each area encapsulates a unique historical and artistic heritage. The San Giovanni area is dotted with Roman ruins and churches, the Pantheon, Piazza Navona and Campo de ‘Fiori, Vatican City, the Imperial Fora, between the Capitoline Hill (one of the 7 hills of Rome) and the Palatine Hill, the Jewish ghetto, the oldest in the world after the one in Venice. Nearby there are places of great cultural interest, like Tivoli, just outside Rome, with its splendid villas (Villa Adriana, Villa d’Este and its tombs). History and tradition are also to be found in Ariccia, lying on a tuffaceous bluff, which attracts hundreds of tourists because of its beauty and characteristic fraschette, little restaurants where you can enjoy the best traditional Roman dishes. Just outside Rome, a visit to Civita di Bagnoregio is a must, also known as the “dying city”, due to the erosion of the tuffaceous rock on which it rests.